Logical folders are the blue folders displayed in the Projects window. These folders are strictly for organizing files within the IDE and do not represent the actual location of files on your hard drive. The Files window shows the actual files and directory structure of your project. While most of the folders are dedicated to the function for which they are named and can only contain files related to those functions, the Header Files and Source Files folders are much more flexible. Either of those two folders may contain both source and header files and the folders themselves may be renamed to anything you like. The same is true for any logical folders you create yourself. You may create new logical folders at the top level or as a sub-folder to one of the existing logical folders. This gives you tremendous flexibility in the organization of your files to make it easy to find and work with everything in your project. 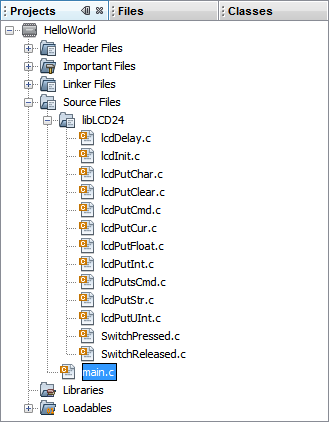 The libLCD24 folder shown in the image at left is one possible example of a user created logical folder. Also, if you prefer to mix related source and header files in a folder together, you are free to do so.